If you haven't seen it, I urge you to watch the accompanying YouTube video of the key moment in the Irish presidential race. It is when Martin McGuinness delivers a hay-maker to front runner Sean Gallagher which has thrown the Irish presidential race into severe doubt once again. Amazingly, what the Sinn Fein candidate accused Gallagher of was nothing criminal or even underhand. It was of receiving a check for a fundraiser for the then Irish Prime Minister Brian Cowen. It is the context of today which has produced a media frenzy. The Fianna Fail brand in Ireland nowadays is as popular as Gadaffi in Libya. The financial collapse brought with it a withering indictment of their pay to play and see no evil mindset. It made many of their insiders rich and impoverished so many now who are left to pay the debts. Sean Gallagher is a former party member who had successfully distanced himself from the Fianna Fail brand throughout the election. But McGuinness charged that he had accepted checks on their behalf up to three years ago despite Gallagher's pledges that he had not. Gallagher has denied he took the check but the damage was done in terms of igniting a media frenzy. He has claimed a Sinn Fein conspiracy to tear him down. They have claimed he was hiding his Fianna Fail past and misleading people about it. Gallagher's cause was not helped by another moment in the final debate when a woman in the audience slated his explanation of how a check that was supposed to end up in his company's bank account was assigned elsewhere. The clear underlying accusation was tax evasion. So Gallagher was suddenly firefighting massive flames on two fronts. Yet he is still a likely winner. 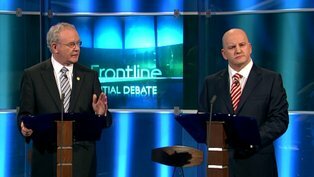 He held a 15 point lead in polls going into the final weekend over Michael D. Higgins in second place. Whether that size of a lead could evaporate overnight remains the unknown question. My guess is it won't-- but it may be a very close run thing. Either way an extraordinary end to an incredible presidential campaign.